This is our web page link. Go to the Calendar Header and you will find the calendar month by month. Underneath it on the right is a printer button. It can be printed! In the top band the little f icon is a link to our Facebook page. Hit it to find out what fun we are having at the shop. Bernina is running a tax relief special by giving 10% off the shop marked price up to $1,000 off!! That's scary because I'm already the best price around! This is on machines and sergers! Shhhh!!! I'm not supposed to tell - but for Mother's Day in May (10th-14th) they are giving a 72 month interest free financing period! So if you have been waiting for the special promotion that does not come around very often - not is the time to pre-select your machine so that I can have it here during the promotion period. I also hear - for those of you who like to gamble - there is a scratch off offer coming up! Sounds like a fun summer on the machine side! FICKLESTICKS: A Dianne Taylor product, will be taught by Bonnie Kastler. The first session is THIS SATURDAY - April 28th (1:00) and there are 3 seats left unless you have your own kit - then call the shop to sign up separately. For you working women - this is a fun class to help you get your creative juices flowing. Please sign up so we can give you the supply list. The fee includes the teaching and a $29 Kit of tools you will need for the projects. Bonnie has gone wild making designs (originals to her) for you to see. If you are interested, she will be teaching additional session as a follow on to this class. WESTALEE RULER BLOCK OF THE MONTH: This class has a pre-requisite of having to have the Free Motion with Rulers class. It will be a 9 block quilt as you go project that will be done in teaching sessions over a 6 month period. Some of the rulers are easier to master than others. The first date is May 9th (1:00). OESD SCHOOL OF EMBROIDERY CLASSES: Do you have an embroidery unit that you never use - any machine type - come and let the ladies teach you to enjoy that equipment. May 15th (10:30) we will be doing the cutest lingerie bags. Great little bag for giving as gifts, using for brides’ maids gifts, can be personalized with color and monogramming. We hope you will join us for this fun session. We have the materials on order and should have a sample in the shop sometime next week. Several of you have asked us to redo the Trapunto class on a different day of the week, since there are conflicts on Tuesdays. Saturday, May 19th (10:30), we will do the same class again. INTRODUCTION TO FACEBOOK MANAGEMENT: Whaaat????? You say??? Yep - I'm not called Amy's Fun Fabric & More for nothin'! Our own illustrious Glenda Kirsch, Past President of the HSV Guild and Trial Lawyer, will be teaching us. This is a hands on class, bring your laptop and you can follow along and fix the things you feel are necessary on your Facebook page. (Example: Security Settings - Who can see your posts, who can see your friends, etc.) How to un-follow someone who is doing annoying posts all the time. How to make sure that your posts are your posts. DID I MENTION THIS WAS A GREAT GIRL'S NIGHT OUT! We will be having wine and finger snacks. I have Sangria and some red to share, you can byob or not - completely up to you. I'm hoping this is the first of may fun evenings at the shop. (Glenda did this presentation for the computer club recently, so this will be a repeat, less the great company, of that event.) When??? Thursday, May 17th. Refreshments at 5:30 and we will begin at 6:00 so you can bring your computer any time that day and get set up. 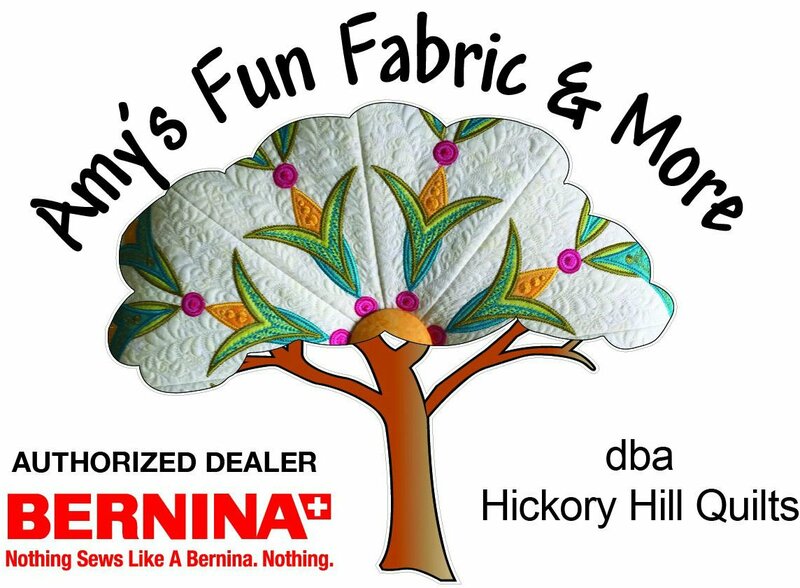 Bernina Academy Needs More Attendees! June 21 & 22 (8:30 snacks/welcome 9-4 both days) is quickly approaching! I have no idea where April went. 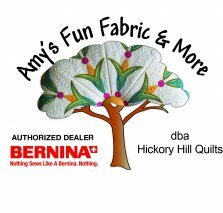 I have to order machines and the kits from Bernina a month out, so we will be having a cut off date in May. Please sign up if you are thinking about attending. Several have asked if we will be teaching the second/follow on class to this. The answer is yes, but it will be in 2019. If you have a new machine and want to learn more about your settings to use on different fabrics - this is a great class. If you are thinking of buying a machine, but you are not sure which one - this is a great place to explore the possibilities. Some have asked if you can bring your own machine. The answer is yes, but I need to know that and hopefully you will be willing to share with a guest. Two people to a machine is the format. The machines order will e top of the line in each category (880 Plus, 790 Plus and 590 Plus). They will be new and marked down as used after the event - you will be able to pick one up at a great price - AND - you get your $200 enrollment fee back applied to the machine. PLAN AHEAD FOR KIDS CAMP! The cost is $350 per student and they go home with their own sewing machine! It is only 1/2 day beginning at 1:00 in the afternoon. July 23 - 27 are the dates. I'll have some machines in stock and they (or grandma) can pick the machine, or I will need to order the machines. This is learning the machine, learning to sew straight lines, making a few projects and generally introducing them to the fiber arts world of wonder. We have a similar week for Adults (August 13-18). This will be learning the machine you already own. We will do simple sewing projects learning to hold a quarter inch stitch. This is set for six days and attendees can attend all or part or part of the sessions. More details to come. SERGER MANIA: We are developing a class based on resounding feedback that you have a serger and stair at it a lot and never have used it! We are going to begin by having a teaching session on the how to's of the machines with some simple use instruction. Our plan is to develop this out to be a monthly make and take project with your surgery much like the OESD classes for embroidery that have been so popular. Michelle Jones will be teaching the sessions once her shoulder is a bit better. (Surgery went better than expected and she is doing PT and well ahead of the projected recovery period - thank you for asking.) No dates yet. STAY TUNED! LOTS OF GREAT THINGS COMING! REMEMBER – THERE MUST BE 3 ATTENDEES FOR A CLASSES TO MAKE OR THE CLASS WILL BE CANCELED. Call the shop if you have questions or need help with sign up! 501-318-2739 The full year calendar is on the web! 5/5 – Mastery Class - Session 1 of 3 for New Machine Owners & Refreshers - Must Sign Up so we have enough materials for the class. We have some surprises coming - Stay tuned! Be watching for details on the June 1 and 2 ONE YEAR ANNIVERSARY OPEN HOUSE! Can you believe it, almost a year has passed. Our red, white and blues are rolling in fast to get you ready for Memorial Day and 4th of July! Our Quilts of Valor folks need to make a trip in. We are expecting another 15 bolts to match all the beautiful r/w/b Wilmington precuts we received. A few fall bolts are here and a breeze of the orient came rolling in.